When you create your documents, there might be paragraphs that should always begin at the top of the page. One example could be that you have a certain paragraph format that you are using as section headings. Your document design needs all sections to begin at the top of a page, so now you have a method to make this happen. There are two ways you can do this. The first is to search for each section heading and manually insert a page break before each of the sections. This can be tedious and time-consuming. It is much easier to format your paragraph so it always begins on a new page. Using page breaks before your section headings can be even more automatic if you use a style for all of your headings. All you need do is format your style so that the heading will always have a page break before it. 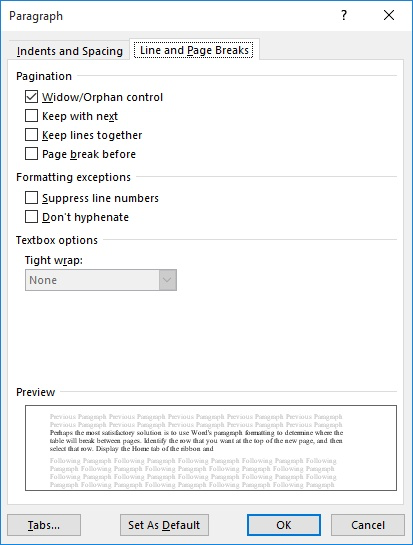 Then, every time you use that heading style, Word will insert the requisite page break.